Auteur: Hoffman A. & Keener G.
Had enough of the same old queen�s pawn openings? Afraid of losing just because you forgot White�s latest move 23 novelty in the main lines? Tired of giving up draws to weaker players who�ve learned how to drain the life out of Black�s major defenses to 1.d4? If so, then the Czech Benoni (1.d4 Nf6 2.c4 c5 3.d5 e5!?) may be exactly what you need. 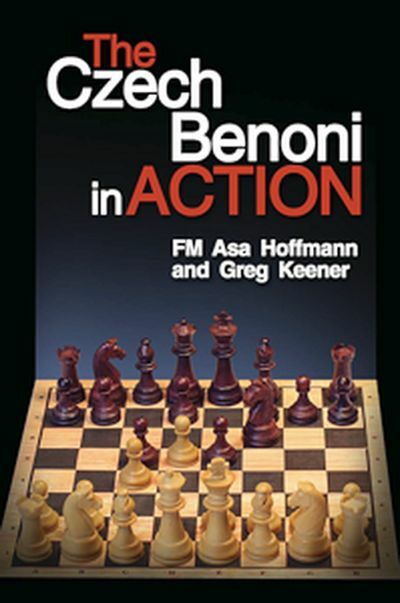 In The Czech Benoni in Action, two practitioners of this little-known but sound counterattacking system join forces to show how you can pose novel problems for opponents of all strengths, leaving them to fend for themselves as early as move 3. Flank gambits, deep behind-the-lines maneuvering, and wildly unbalanced positions are the norm here. Focusing on strategic ideas rather than masses of variations, and using complete games to show how the themes persist even into the ending, the authors survey White�s common responses and explain how to handle attempts to sidestep Black�s setup. To help guide you through the complications, a concluding selection of typical tactical motifs rounds out the most complete treatment of the Czech Benoni in print. Asa Hoffmann is a FIDE Master, chess teacher, and author. A New York City Junior Champion and U.S. Armed Forces Championship medal winner, Asa was ranked 21st in the nation by age 21 and went on to have a more than 50-year tournament career, competing against most of the country�s top grandmasters. He is currently ranked the top senior blitz player in the U.S.
Gregory Keener holds a B.A. in French Literature from New York University and a J.D. from Brooklyn Law School. After leaving his job on Wall Street, he became a FIDE Instructor, manager of the Marshall Chess Club, Web developer, and author. He currently teaches chess at a charter school in Williamsburg, Brooklyn, where he also lives.